What Animals Cannot Walk Backwards? The vast majority of animals are capable of walking backwards, even if it's not a frequent occurrence. This ability helps animals get out of tight corners and helps protect them in situations when they feel threatened. Because of the usefulness and importance of this skill, it shouldn't be surprising that the number of animals that cannot walk backwards can be counted on one hand. Kangaroos are well known as large, hopping mammals from Australia that carry their offspring in pouches. What may not be so well known, though, is that kangaroos cannot walk backwards. Their hopping movement is called saltation. 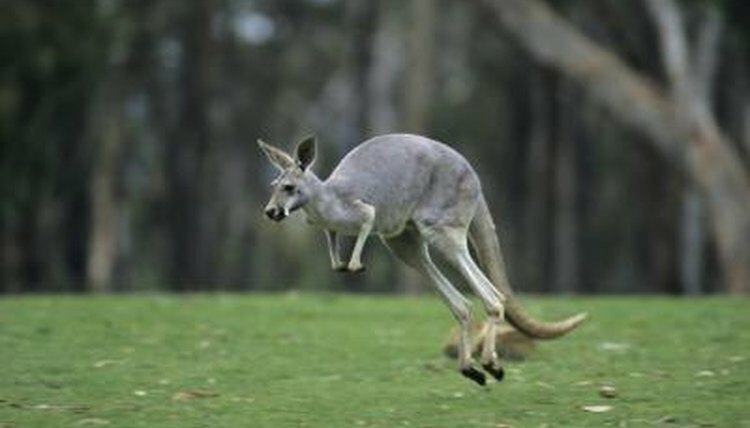 During saltation, kangaroos push off with both large feet at the same time, and they use their tails for balance. The combination of their muscular legs, big feet and tails may help kangaroos move forward effectively, but these appendages also prevent them from going in reverse. Like kangaroos, emus are from Australia. They are flightless birds similar in looks and characteristics to ostriches, though they average about 10 inches shorter in height. Unlike ostriches, emus cannot walk backwards; however, it's not known why. Emus are known for their fast sprinting and long distance running. They're the only bird species that has calf muscles. Internet search engines may return some results suggesting that alligators and penguins are not able to walk backwards; however, all evidence shows that both animals are capable of doing so. While their backward movement may not fall under the standard definition of walking, they both have methods of propelling themselves in a reverse motion that can be considered a form of walking. Technically, penguins don’t even walk forwards; they waddle. University of California at Berkeley researcher Tim Griffin explains that a penguin’s waddle occurs as “kinetic energy and gravity combine to keep it rocking back and forth over its center of gravity.” Griffin also points out that the waddling for a penguin is more efficient than walking is for a human. However, penguins can waddle backwards. The most common form of movement for alligators on land is called the “belly crawl,” and while an alligator cannot walk backwards on its belly, there is another form of movement that allows backwards motion: the “high walk.” When an alligator is high walking, its entire body and the majority of its tail is off the ground. This form of locomotion is used primarily when an alligator is getting out of water or moving over an obstruction, but it also allows alligators to move backwards. Animal Question.org: Can Alligators Move Backwards? Laura Payne has been freelance writing for several online publications in her free time since 2006. She holds a Master of Arts in linguistics from Wayne State University and a Bachelor of Arts in journalism from Oakland University. Payne teaches linguistics classes at both universities on an adjunct basis. What Is the Fastest Lizard? How Fast Can a Bumblebee Fly? What Bones Power a Kangaroo's Jumping? How Fast Is a Donkey?